“Great hug giver,” Lorde says of the rapper. Lorde is currently on tour and, as we saw in Chicago with a Kanye West cover, she's paying tribute to some local heroes along the way. Thursday night, March 29, saw the Melodrama tour hit Toronto so, naturally, it was Drake's turn to get a shout out from the New Zealander. “Great hug giver,” she said of Drake before covering his song "Shot For Me," which features on 2011's Take Care. 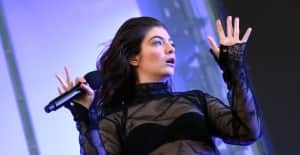 Lorde has also debuted covers of songs by both Frank Ocean and Carly Rae Jepsen while touring her latest album. Check out her latest above. Thumbnail image courtesy of Steven Ferdman/Getty.